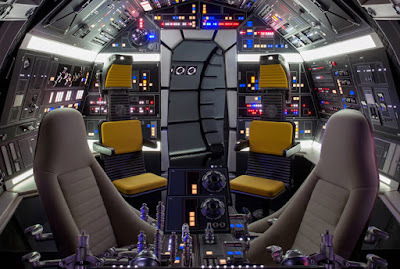 The annual San Diego Comic Con kicks off this week and Lucasfilm will give fans an opportunity to get their photo taken in the cockpit of one of the most iconic ships of all time. StarWars.com announced the plans for the Lucasfilm pavilion at Comic Con, and they include the traveling Millennium Falcon experience. Fans wanting a picture in the Falcon's cockpit will need to acquire a free ticket, which will be distributed each day on a first come first serve basis along the back wall next to the Lucasfilm pavilion. In addition, the company is also bringing a display of screen-worn costumes from the recently released Solo: A Star Wars Story. The display will be comprised of the outfits worn by Han Solo, Lando Calrissian, Qi'Ra, Dryden Vos, Enfys Nest, and Chewbacca. There are also several Star Wars panels taking place, including a celebration of the tenth anniversary of the animated series Star Wars: The Clone Wars taking place on Thursday at 11:45am in room 6BCF. #RogueOne costumes on display at the #StarWars pavilion at #SDCC!